I have been making this banana bread for many years. 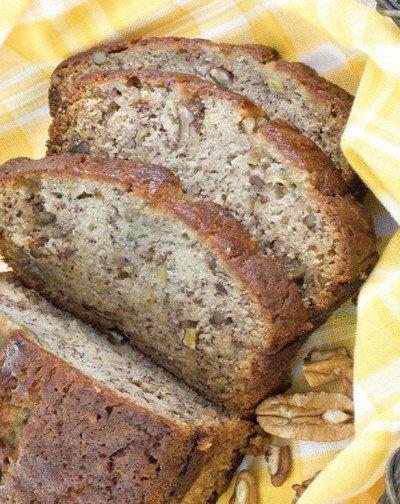 It is always moist and delicious and a great way to use up browning bananas! Sometimes I make loaves in mini-bread tins and freeze them individually. You can take them out when unexpected guests come over for a cup of coffee! Grease a loaf pan with cooking spray. Mash the bananas with a fork, then add the eggs and mix well. In a separate bowl combine the flour, sugar, salt, and baking soda, slowly add to the banana mixture. Then fold in the walnuts, pour into a loaf pan, and bake for 1 hour (test with toothpick after about 50 minutes). Let cool, then remove from the pan and enjoy!